Green Mars is a novella published for the first time in 1985 in collections. 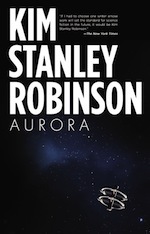 It was published in paperback collected with Arthur C. Clarke's novella "A Meeting With Medusa" in 1988. It is not to be confounded with the novel of the same name. Despite the title similarity, it does not take place in the same universe as the Mars trilogy novel Green Mars, instead forming a sequence with the short works Exploring Fossil Canyon (1982) and A Martian Romance (1999) which describe a different terraformed Mars. All three works were included in the collection The Martians along with Arthur Sternbach Brings the Curveball to Mars, which shares a character. It tells of the climbing of the tallest volcano of the Mars (and of the solar system), Olympus Mons. To avoid confusion, it’s worth remembering that although many of his books are set on Mars, not all of them are on the same Mars. In particular, the original Green Mars - a novella about climbing Olympus Mons that deals with the now-familiar themes of the ethics of terraforming Mars and the memory problems of longevity - seems to be set in a slightly different universe. “Yes, I wrote that mainly to stake a claim - at least a moral claim - on the name. I thought Green Mars was such a good name, such an obvious name. And when I heard about Olympus Mons, this enormous volcano, I just had to write about climbing it.” It turned out to be a sensible precaution; he’s since heard that Arthur C. Clarke considered using it as the title for his collection of articles on terraforming Mars (now called The Snows of Olympus).